The Ultimate Summer Stag The ultimate Summer stag could include a variety of activities for you. Whether you and your compadres are into traveling to foreign places or just seriously tearing it up at the local - check out these tips to ensure you have an unforgettable stag! (..which may or may not be hazy the following morning, depending) Location: Make use of that fine Irish Summer weather and hit up any of the amazing coast lines we are blessed with. If you’re passport is burning a hole in your pocket, then it is with good reason! 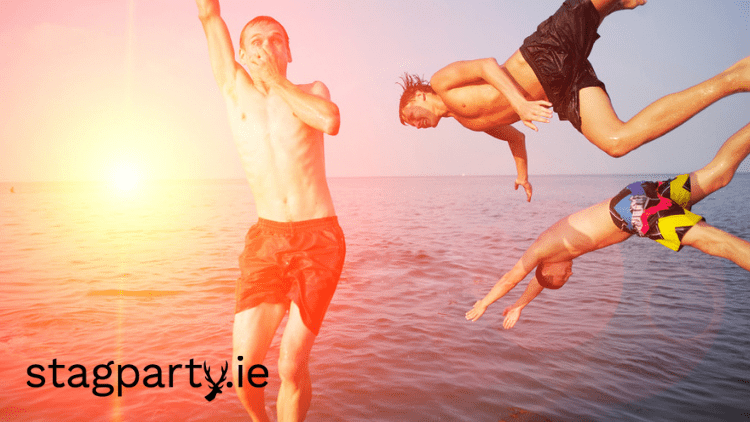 There are tonnes of amazing locations for you to have your stag party abroad. Prague, for example, has a legendary club scene where you and the lads can tear it up. Group: You might have ten million friends and only really get on with your best mate and your cousin. Consider who you invite on your stag night. Ask yourself, what would you really enjoy? If it is hitting up the parents house for a barbecue with a group of the lads and watching the match - so be it! You might rethink inviting your wildest college friend, then again - he might be the very person you want to take inspiration from for this event! Activities: Take this as a good excuse to try something you have always want to try. This may or may not be Bubble Soccer, but we have a sneaking suspicion that it is. Arranging an off-the-wall activity like this is a great way to do something that isn’t drinking heavily - although their is likely to be pints after in many cases. So there you go! The recipe for the ultimate Summer stag. Enjoy this exciting time with your fellow brethren before heading down that aisle! The Benefits of having a Stag Party abroad The benefits of having a Stag Party abroad are endless and obvious, let us just refresh your memory. Traveling: Looking slick in an airport is a thrill that many of us forget about until we are browsing the duty free, sporting our fanciest sunglasses and luggage. Taking off in a plane and people able to see entire countries from above, is another thing that we forget is majestic. Plus, airport pints on the Stag are class if we're being honest. Tan: Coming home slightly browned off is an accomplishment in itself. Everyone wants a bit of a healthy glow! The weather being better in places such as Portugal or Spain means that you won’t be sporting a farmers tan when you hit one of the Irish coasts for some surfing a few weeks later. Anonymity: Sometimes, just sometimes, it is better if your neighbours, cousins, plumber doesn’t see you embracing the Macarena like you invented it in a club at 3 o'clock in the morning. Getting a break from the tiny Island that is Ireland will give you a new lease of life! But then again, there is a lot of social media these days.. Memories: The pictures of you and your gang will be legendary. Whether you hike to scenic views or chill by the pool, you will all probably never look this good again - so get snapping! Traveling abroad is one of the most memorable things you can do in your lifetime so enjoy every minute of it. So, dig out that passport and squirt on the factor 40 and you are off on a Stag Party abroad! 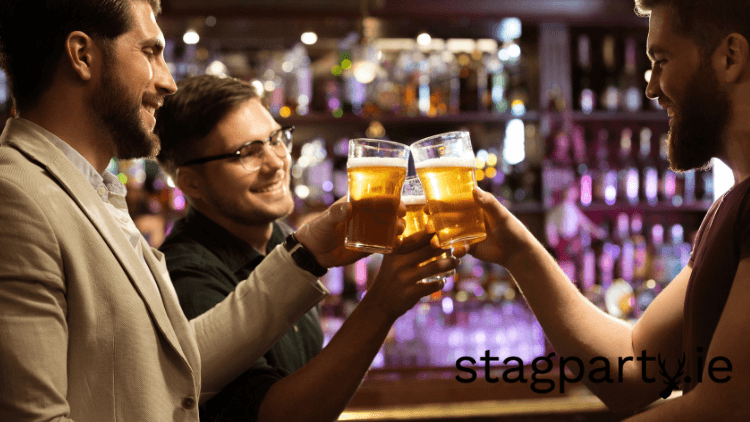 4 Stages Of Ordering a Pint on the Stag Night Let's be honest lads, after the stag party activity the main thing on the weekend is giving your best mate a proper send off over pints. The anticipation for a stag weekend knowing you're going on one hell of a session with the lads is always an immense feeling. And when that first sip touch your lips you'll feel yourself settling in for a wild weekend to the sound of ahhhh...However, there is 4 Stages Of Ordering a Pint on the Stag Night that add to this simple pleasure. Getting the Barman's Attention There is a theatre almost when it comes to ordering a pint. You approach a busy bar. Jostle for space. Then you're trying to decide how do I grab his attention. Do I give a wave? The Head Nod? Stick my head under the tap because I'm gasping? (We do not recommend doing this as your night will end very early.) Ordering the pint You've got the barman's attention. Now it's time to order, but it's the Stag night and the bar is heaving, music pumping and a few women screaming because their tune came on. So, do you shout your order? Do the hand signal for a pint? Or do you mouth the words for 2 pints of Heineken and 3 Jagerbombs. All is depending on the size of the order and if the lads have spotted your prime position for getting a round in for the stag. If it's just the one, I go with the tried and tested pointing at the tap. Especially if it's loud. The Pouring of the Pint We all have our ways of pouring a pint so there is always a nervous wait as you see the barman pulling the pint. If it's beer you just want and to comeback with a little bit of head and not resembling something like they just poured Heineken into a glass of fairy liquid. Most of the time your sound with beer being poured in a bar. However, if you're a stout man like myself, there is nothing worse than watching a bad pour. It almost spoils the pint before it has even graced your lips. The glass tilted to 45 degrees and filled near to the top then allowed to settle. Give it time and then finish it off. It still haunts me watching someone pour a pint of stout straight to the top and then serve it to me on a stag party night. The First Sup It's the simple pleasures in life lads. But arguably one of the best is that first sup off a pint when you're gasping. You've just had a mad day of Paintball, Karting or Clay Pigeon Shooting, you've worked up a thirst and now it's time to get settled into a night on the beer. After all the waiting the barman hands your pint. You can't even wait to take it back to the table. You dive straight in and it's pure bliss and you know it's going to be one hell of a Stag Party night. So, there you have it lads. The 4 Stages Of Ordering a Pint on the Stag Night, we all do it differently but all get the same result and it's all about giving one of your mates one hell of a Stag weekend. Finally, if you're planning a Stag at the moment. Drop us a line on info@stagparty.ie or call 051-390383 now and we'll be sure to give you a helping hand lads. The Five People you will meet on St. Patrick's Day Oh, St. Patrick's day - you great, green ferocious beast. We have lived through many years of you and encountered you in every shape and form. From the college days of knocking back green shots, to the years we have abstained from your green glory largely due to the fear of what ensued the year previous - St. Patrick's Day, you are part of us and we are part of you. This list is of the five people you will meet on St. Patrick's Day, you may have been in their shoes once upon a time. The Pint Man They don’t go at it often but when they do they go at it awful and very hard. The pint man is out for one reason and one reason alone : to drink a very long and steady stream of pints at the bar. These men seem as if they actually eat roast dinners, ham sandwiches and pints for a living. Someone who had work the next day They will tell you. It will be the first thing they say to you. You will be told instantly. They have work in 5 hours. Can you believe it!? Yes, you can - because we have all been there! Maybe offer them a pint of water at some stage. They might pour it over their head instead of drinking it but sure, it’s Paddy's day after all. The guy who started way too early The excitement can be hard to contain for some lesser experience St. Patrick's day punters. They might have ‘Irished-up’ that morning coffee a little too much, in the spirit of things and gotten carried away. This person doesn’t last very long. They will be in a taxi home before the sun sets. The Tourist You might hear them screaming about their Irish Ancestry at the back of the bar, or hidden behind a large map walking up and down the street. Point them in the direction of a large bar full of other tourists so that they feel at home amongst the other selfie sticks and bum bags. The person wearing too much green How much green is too much on St. Patrick's day!? Some may say you can have to much and this is true to an extend. From cheeky slogans to glittery leprechauns, the awful Paddy’s day garb has is not without its charms. 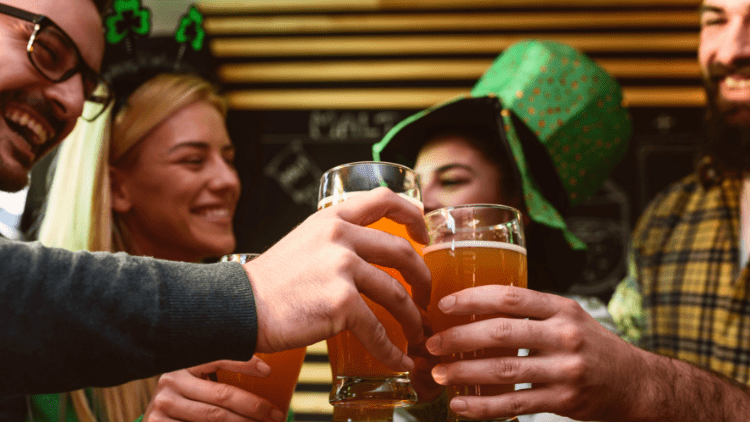 So whether you are a Patrick's Day veteran or a newb who has it all ahead of them, you are bound to bump into the five people you will meet on St. Patrick's Day journey. Which one will you be this year? Or are the events of last year still haunting you?! Brave the parade and get a pint in! St. Patrick's Day only happens once a year. Thinking of having a Stag night soon!? Check out these slightly more sophisticated ideas here! Finally, if you need any help planning your Stag Party weekend. 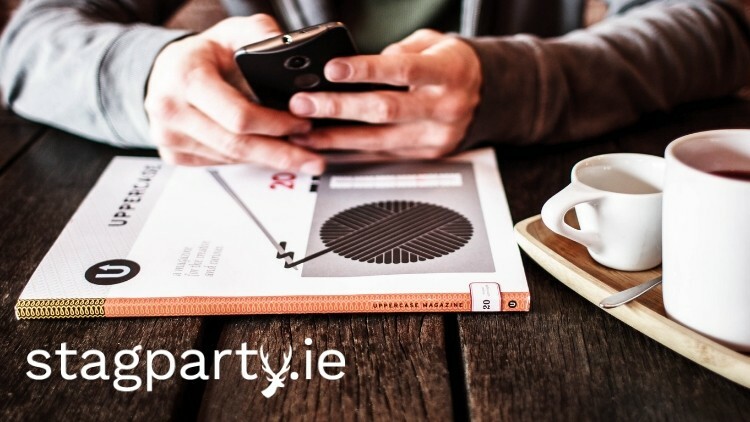 Drop us a line today on info@stagparty.ie or call us on 051390383. Paddy's Day Stag Party Whether you are Irish through and through, living in Ireland for your whole life, sporting a serious farmers tan and have a penchant for chicken rolls - or just a big fan of Ireland and Irish culture, having a Paddy's Day Stag party has its obvious appeal. 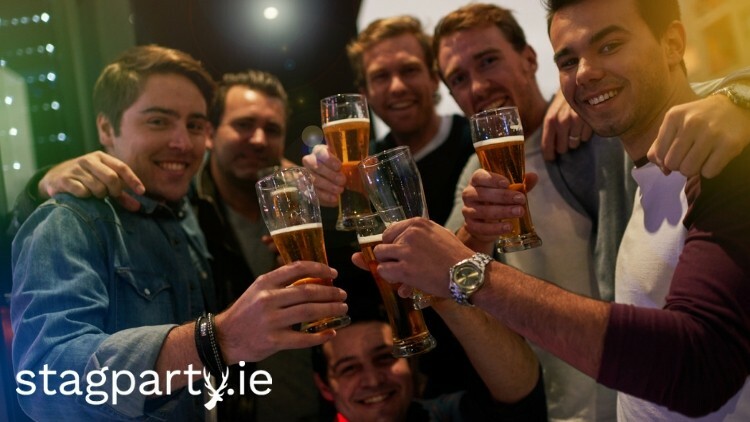 There’s a crazy festive atmosphere and a long weekend - the conditions are perfect for a Stag Party. 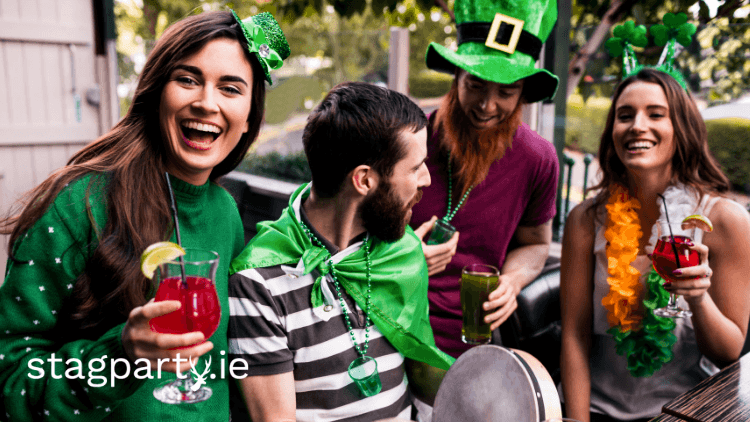 But if ye're not the crowd who are into heading into a packed town and tunneling your way through the crowds, maybe check out these alternative Paddy's Day ideas. While they still have St. Patrick's Day vibes, they are a tad more refined.. At least for the start of the afternoon anyway! A tour of the Aran Islands is one way to see a hell of a lot of green this St. Patrick's day. This scenic landscape is head clearing and breathtaking. Clear out the cobwebs for the afternoon and then decide whether to hit the town. Any fans for Father Ted? Check out this amazing Father Ted tour. Make your own Eurovision entry by the lovely horse waterfall and pass many, many Father Ted quotes back and forth to one another. Or, depending on how much you identify with that farmers tan you sport - you may want to chance your arm at this amazing Culchie Craic experience! Milk a cow, chase a hen around a yard, fall on your backside in a pile of mud - all of the good things! This hilarious experience will be one that will be hard to be forgotten. What ever you end up doing, the craic will be in the air! St. Patrick's day is the perfect time to celebrate a stag party! Finally, if you're interested in booking your Stag Party or need any more information. Drop us a line today on info@stagparty.ie or call 051390383. Stag Party Costumes for 2019 I've always been a fan of going with costumes on a Stag Party weekend. Now I know some lads hate it but it does get everyone in the mood for a stag party weekend full of messing. So, I've put together some of my favourite dress up ideas and Stag Party Costumes for 2019. Party Animals What were your party animal days like? Are they ongoing or are memories hazy? The Party Animal costume theme is one to remember. Get each member of your stag party to wear a onesie that is themed like there favourite animal. Lions, tigers, bears - etc! This theme has loads of comedic effect. Whether you are planning a night out or a few rounds of laser tag, seeing your best man dressed as a monkey or a bunny will never get old. Wheres Wally Wheres Wally's outfit is iconic and instantly recognisable. Perfect for the stags who are on an adventure somewhere new. A gang of Wally’s on tour playing some high level hide and seek? Or trying to confuse a load of drunk people in a pub or club of which wally they were talking too. It's an easy costume to put together and if you think you'll have any hassle getting in anywhere, whip the glasses off and throw on a jacket. 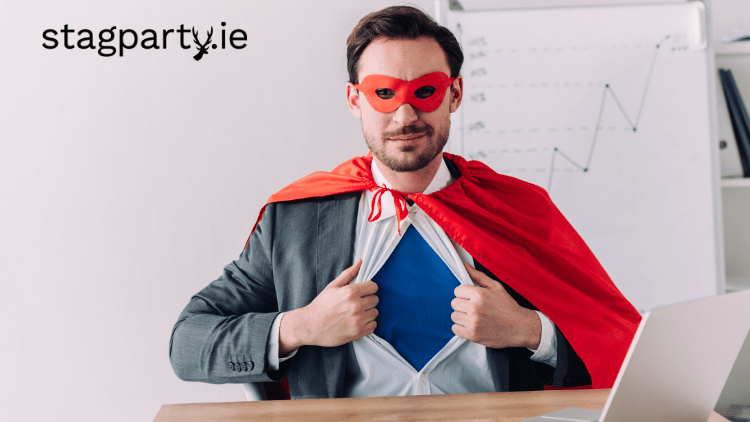 Super Heroes Whether the grooms super power is providing moral support through hangovers that have shaken the earth, downing a pint in 0.5 seconds or both - he will be all about owning up to his super hero status on his stag night. Put on those masks and capes, go out and save the day! Let your inner nerd out and dress as your favourite super hero, or stick to a basic capes and mask combo. Try racing around in a hover craft like the retro futuristic super heroes from the old comics! Finally lad, if you don't fancy the whole dressing up thing as a group. Just make the stag do it. It's his stag at the end of the day and everyone should know it's his last night of freedom and he should be dressed ridiculously. 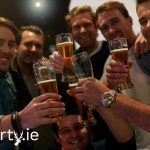 If you're interested in booking your Stag, drop us a line today on info@stagparty.ie or call 051390383 to get the ball rolling. We'll make sure you have a brilliant stag party weekend. 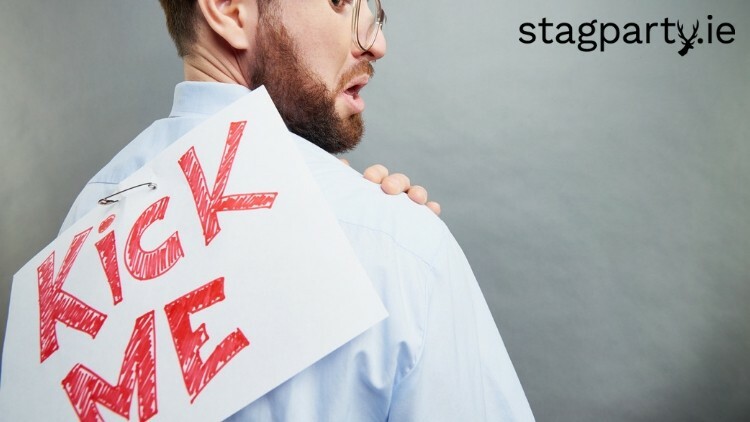 How To Make It Through The Stag Party Weekend It's that time of the year lads when all of a sudden you're added to a variety of Stag Whatsapp groups. All the lads are rifling in ideas and suggestions of where to go and what to do. As well as videos that should never be opened in public. It's at this moment it begins to dawn on you. You're about to head away on a weekend with a load of mad men. You're filled with excitement and worry all at the same time. So I thought I'd throw together a little guide on How To Make It Through The Stag Party Weekend! Pace Yourself Golden rule on a Stag Party weekend is pace yourself in my opinion. It's a marathon not a sprint. When you kick it all off on Friday after work, you're in for one hell of a session. You don't want to miss a thing on the Stag so be sensible enough lads. Wait til later in the night before you hit the hay to really let loose. Water Pick up a 2 litre bottle of water lads. Lash some into you before you fall asleep and neck the rest first thing in the morning. You need to rehydrate a bit to plough into the second day and night of the Stag weekend. Soakage Round up the lads and make sure you all get in a hearty breakfast lads. You'll need the energy for the day and to soak up the drink from the night before. A liquid only diet will not end well on a Stag. Soakage is key! Active Stag Party Activity An active stag party activity like paintball, bubble football or zip lining is always a great option. Not only are they brilliant craic but you'll sweat out those shots we organised you in the club last night. You'll feel like a new man after a bit of run around, a sweat and a shower. 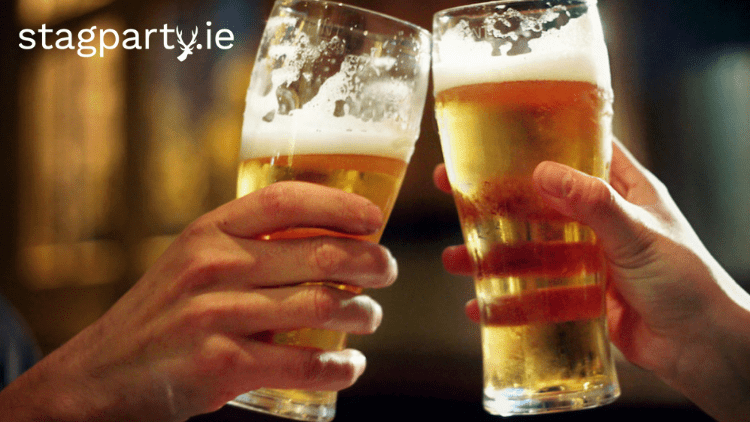 You'll be ready to tackle the pints, an afternoon of sport on the telly and a wild night out. The No Turning Back Point This is the point on the last night of the stag, around the 1am mark. Where you just go for it with shots and pints and make sure the Stag has a proper send off that he'll never forget. You're heading home tomorrow so you can recover then. The Hangover Cure What ever your hangover cure is lads. Have it waiting for you when you get home. You didn't have to deal with a hangover after the first night as you probably didn't sober up. But, with work tomorrow and the fear setting in. You need your tried and tested cure to get you through. All in all though, it's all worth it for a killer stag party weekend away with the lads. How To Make It Through The Stag Party Weekend should always be about maximizing your time partying with the lads instead of being in a heap back in your accommodation. Finally, if you're interested in booking your Stag Party. 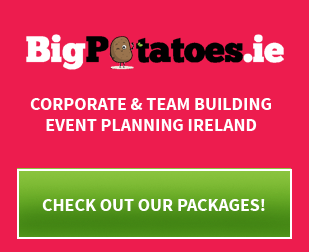 Drop us a line today on info@stagparty.ie or call 051-390383 now for more details! Hangover Survival Kit What is more memorable than your best friends stag night? The morning after! Come to think of it, most of the time it is difficult to remember the stag night at all!? In fact, parts are hazy. Thank god for camera phones, right?! The best way to sooth your best friends post stag night condition is to assemble the perfect hangover kit. Pool together all the nifty hints and tricks you have accumulated over the years by each others side and combine them in this amazing hangover survival kit. It may not erase the efforts of the night previous but it will help. A Large bottle of water: A large part of a hangover is severe dehydration. When your friend is struggling to understand where he is, he may find it difficult to muster the courage to leave the bed. Fill a large bottle with water and he will thank you later! This simple yet vital component will be the most effective tool in your hangover survival kit. Vitamin C: We all know that Vitamin C is amazing for us. Think of how amazing it would be in your best friends hour of need! Vitamin C sachets can be purchased from most chemists or super markets. Pop a few into this hangover kit so that your friend can reap the benefits of Vitamin C, and replace some of the health that he might have lost. Eyedrops: Eyedrops really help you look like you are a lot more alive than you feel. This may be particularly useful if there are soon-to-be in-laws floating around. Your best pal can pop some drops into his tired, red eyes and they will improve just enough so that he doesn’t look like a demon. He will thank you for it! Chewing Gum: The benefits of this menthol scented wonder tool are well known. A simple packet of chewing gum can make the world of difference! Your friend will have a minty scent that masks the smell of defeat. Also, it will replace any lingering alcohol tastes in his mouth from the night before. Something both he and the bride-to-be will be thankful for when he gets in from the Stag Party weekend. Chocolate: In recent years it has been said that chocolate is one of the best cures for a hangover! Some decent, 70% or darker chocolate is full of antioxidants and can help restore the happy feelings that have been exhausted by last nights hoodwinks. Include a large bar of chocolate in your hangover survival kit to create those fuzzy feelings! Plus he's probably going to be hungry too. A voucher for their favourite takeaway: Top things off with the ultimate cure. A hefty voucher for a local takeaway where they can spare no expense in indulging their wildest 3-in-1 or fish and chip fantasies! Emotions are running high at this time, and do not be alarmed if this makes your best friend break down in tears. Get a vouchers for online food delivery app! Or maybe just swing by with one of everything from the menu at their favourite Chinese. A way to a man's heart is through his stomach lads. After putting together this outstanding hangover survival kit for the stag party weekend, your friend will be so grateful - they may in fact try to marry you instead. Your best friend will be fully prepared to face the room full of in-laws and marry the bride of his dream when he returns from one of the best weekend of his life. Grouptrakk Hi guys! Here is a link to our payment management system, Grouptrakk. If you have any issues opening it drop us a line! 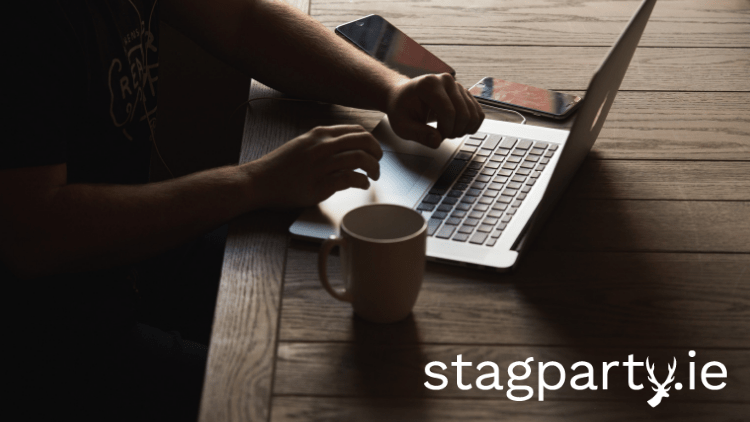 Booking Form Page Hi guys, here is a link to our booking form page to make a booking with us here at StagParty.ie! If you have any issues opening it drop us a line! The Best Stag Party Pranks There are a few elements that make up a brilliant stag party weekend. A great location, a stag party activity that gets everyone going, a few...to many beers and of course a humiliating the stag. When and wherever possible. There is nothing better than a good stag party prank. And if you put a lot of thought and effort into it. There's no way he can be mad, he simply has to appreciate the effort. If you're looking for a good prank, here are the best Stag Party pranks we've seen recently! The Giant Boarding Card Travelling abroad for the Stag. There are so many pranks you can pull at the airport and over there where, for the Stag's sake, no body knows you. One classic prank is to print off the Stags boarding card on A1 paper. Now if you've never seen sheet of A1, it's bloody massive and it will be comical watching the stag try to scan through at the barriers. Do make sure you have an extra one printed off in A4 just in case the security don't enjoy this stag party prank as much as you. Book the Stag on a Different Flight Another one for any Stag Party travelling abroad. The groom tends to have very little to do with planning his stag. That's the best man's job. He gets a bit of input from the stag but, along with us here in StagParty.ie, he plans the whole lot. If he is also booking his flights for him, a great stag party prank is to book the Stag on a later flight home, on his own, when he is in a cruel condition and just wants his bed. The look on his face when he sees you all heading off through the gate and the realization he has a hours to wait for the next flight is priceless. Bowling Ball and Chain No need to explain this one really lads. As he's about to get hitched and will have a ball and chain. Simply tie an actual bowling ball and chain to the stags leg. He'll get tired pretty soon lugging that thing around. Paintball Firing Range This is simply going to hurt. If you plan on enjoying some paintball on the Stag. At the end of the day. Unload all the left over paintballs on the poor stag. Or if you're feeling nice everyone just gets one shot! Ouch! So, there you have it lads. Just some of the Best Stag Party pranks you can pull on the Stag. Do you have any good stag party pranks we should know about? Finally if you need a hand planning an upcoming Stag Party. Drop us a line today on info@stagparty.ie for more details! Wild Ideas for your Stag Party weekend! Wild Ideas for your Stag Party weekend! Every guy wants to have a wild Stag Party weekend. In a way, one last big blow out before he ties the knot. He wants the feeling that in a way he's left nothing on the pitch. To use a sport reference. So, with 2019 stag party planning well under way, I thought I'd throw in a few Wild Ideas for your Stag Party weekend into the mix. Jelly Wrestling Two words I'm sure has peaked your interest. Yes you heard me right. Why not enjoy a spot of jelly wrestling and a show to kick start the Stag Party proceedings. Just a heads up, you may have to venture abroad on the stag for this activity. Hovercrafting It's not every week you're going on a stag so why not choose an activity that's a little out of the ordinary. So why not satisfy your need for speed and get an adrenaline rush when you spend an afternoon racing Hovercrafts! These hovercrafts are brilliant craic lads and will have you on edge from start to finish. Axe Throwing Unleash your inner wild man on the Stag and try a spot of Axe Throwing lads. Nothing seems more manly then flinging axes at targets for an afternoon followed by a few pints in the pub afterwards. It will set you up nicely for the night ahead. Drive A Tank This is on my list of stag party activities for my own stag lads. You get to take an actual Tank for a spin and drive over a few obstacles along the way. You'll have to head to Prague for it, but anyone who has been to Prague on a Stag Party weekend. The city is a wild night out and the beers are cheaper than water lads. That says it all. Bare Foot Broken Glass Challenge Finally on our list of Wild Ideas for your Stag Party weekend. We have the Bare Foot Broken Glass Challenge. Now I can't imagine it's high on many guys lists to walk over shards of broken glass as a stag party activity. But this is a wild idea lads. Just imagine the rush after completing the challenge. So, there you have it lads. Just a few Wild Ideas for your Stag Party weekend to wet the appetite for your Stag in 2019. Will you be trying any of these activities out? Lastly, if you're interested in booking your Stag Party. 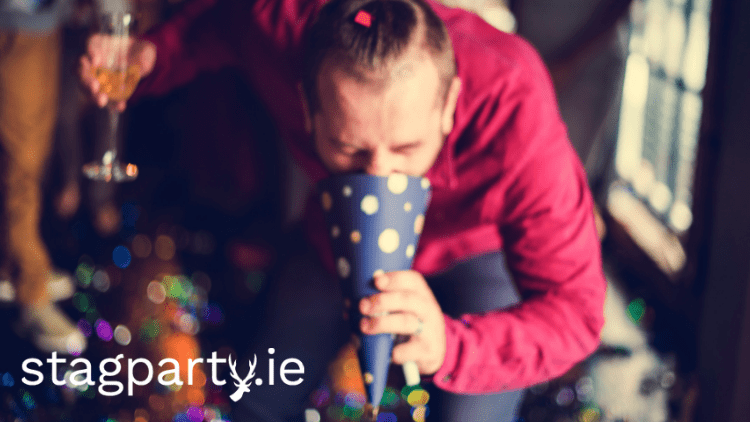 Drop us a line on info@stagparty.ie or give us a call on 051-390383 now!